This Saturday, Ottawa's active fashionistas will gather at the Kichesippi Brewery to check out the latest trends in bicycle gear. The Ottawa Velo Vogue Bicycle Fashion Show is back for its second year. Launched two years ago, Ottawa Velo Vogue is a photoblog that features stylish cyclists in Ottawa. "We interview people, take lovely photos and then post them so you can meet these awesome characters and their bikes," explained co-founder Zara Ansar. 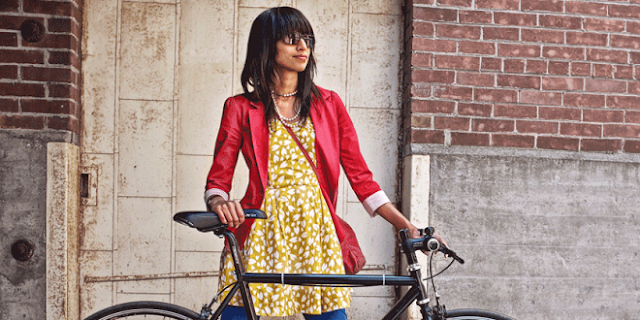 "Launching a bike fashion show was the natural extension of our blog." This year, Ottawa Velo Vogue decided to fundraise for Cycle Salvation, a non-profit organization that helps turn bikes at the end of their road into finely tuned riding machines again. They also help teach bike knowledge to everyone, including providing jobs and skills development for people down on their luck, helping to alleviate poverty. The more bikes in a community the better! "[It is] such an amazing organization, we are extremely honoured to be working with them," said Ansar. Check out their video here. The fashion show will feature bikes and apparel from local designers and designers from around the world. The show will feature everything from stylish bike gear to feathered leather goods to recycled metal masks to Prince Edward County Wine tours (with bikes). People can bid on interesting items during the silent auction and snack on treats from vendors like Café My House, Suzy Q Donuts and the Ottawa Streat Gourmet food truck. Kichesippi beer will also be available, as well as the brewer’s new Harvey and Verns old style soda. There will also be music and a visual show as people arrive. "We want everyone to have fun, support Cycle Salvation and enjoy the show," said Ansar. Last year, the event received positive reactions from the public, surprising many people walking past city hall. Based on its success, Ansar and the team at Ottawa Velo Vogue decided to build on the fashion show and work on its growth. "Interest in bike lifestyle has been skyrocketing as North America, adapting the relaxed and stylish riding style of Europe and we're pedalling hard to keep everyone up to date on various looks and apparel," she explained. Interested in fashion? Be sure to check out the Velo Vogue bicycle fashion show. And don’t forget to sport your best looking active wear!